The Roanoke River Blueway offers a unique combination of urban, front country, and back country recreation opportunities in the upper Roanoke River watershed. Enjoy canoeing, kayaking, fishing, tubing, wading, wildlife viewing, and watershed education – with convenient access to other outdoor and cultural amenities in Virginia’s Blue Ridge. Make sure you check the water levels before you head out on the water! The brochure has information about all recognized access points on our stretch the Roanoke River, as well as information about rentals and other user needs. 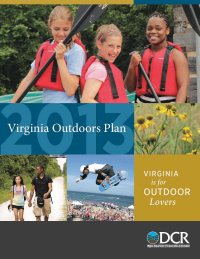 You can find it at local visitor’s centers, parks and recreation offices, and outfitters like Roanoke Mountain Adventures, Walkabout, and Back Country Ski & Sport. We’re so excited to bring you this resource, and hope you enjoy! The Roanoke River Blueway received a 2016 Governor’s Environmental Excellence Award for implementation of the Virginia Outdoors Plan.The awards recognize the significant contributions of environmental and conservation leaders in four categories: sustainability, environmental project, land conservation, and implementation of the Virginia Outdoors Plan.